Occasionally you get one of those days where you simply don’t want to brush your hair. Or maybe even take a shower. It’s moments like those when having a super cute crochet hat comes in handy. Just throw your hair to the side or up under the hat, and you don’t have to worry about it. That’s how my Cadence Cabled Cloche crochet hat pattern was born. It’s an elegant hat featuring gorgeous design elements that might help trick people into thinking you actually take care of yourself! Haha. 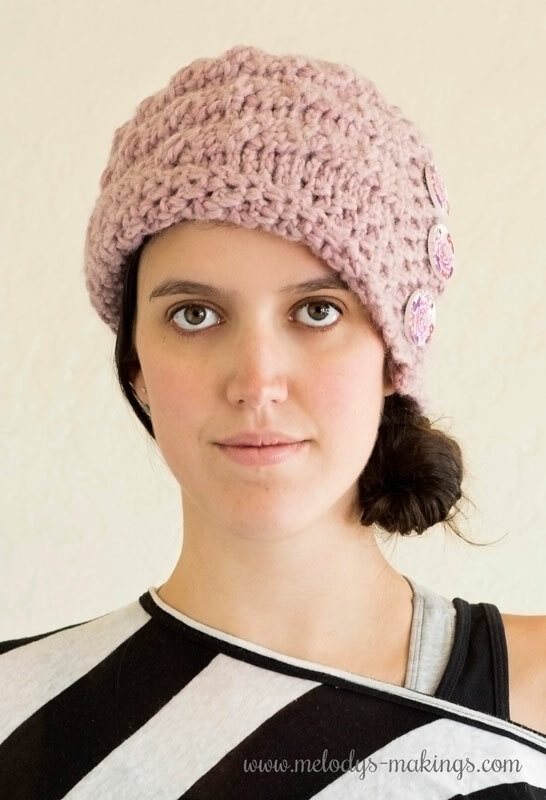 This free hat crochet pattern features bulky (5) weight yarn and size 6.5mm (K/10) crochet hook. Pattern features all sizes Toddler, Child, and Adult. Yarn: Approximately 150 yards of bulky (5) weight yarn for smaller sizes, and approximately 220 yards for larger sizes (I used Ironstone Yarn – Harmony for mine). FPSC: Front Post Single Crochet – Insert hook around post of next stitch by placing between sts and coming through the back of the stitch and onto the other side. Yarn over, and pull loop through as if you were doing a normal SC stitch, Yarn over and pull through both loops. BPSC: Back Post Single Crochet – Insert hook around the post of next stitch by placing between sts on back side and coming around the front of the stitch and back to back side. Yarn over, and pull loop through as if you were doing a normal SC stitch, Yarn over and pull through both loops. Cable Sequence: Skip the first next two, sts, and front post double crochet around each of the following two sts. You will now have 2 FPDC sts that are leaning to the right. Go back to the first two skipped sts, and FPDC into the first and then the second stitch. This will create 2 sts that cross over the other two and slant to the left. Repeat row 3 until your piece measures approx. 1.5 inches (3.75cm) from the starting edge. Repeat rows 7-10 until your piece measures approx. 19 inches (48.25cm) from the starting edge. End on a repeat of row 10. Secure work, and using your yarn or tapestry needle, sew the starting edge of your work over the ending edge of your work with a 1 inch (2.5cm) overlap. If the starting section is slightly wider than the ending section due to the tension of the cables, fold down the top of the starting section and secure it to the inside of your hat so your piece is even all the way around. When picking up sts during the next section, you can either pull sts from the top of this fold or from the overlapped section behind it. Pick up and Single Crochet 50 sts around the top of your hat. Make sure the stitches are evenly spaced, and that you’re doing your single crochet stitch around the outside BPSC stitch we did along this edge. We’ll be working in continuous rounds for the decrease section. Place stitch marker. Add two or three matching buttons (I used 1.25”) stacked one on top of each other over the overlapping section of your hat. Then, fold up approx. 1.5 inches (3.75cm) of the brim of hat on the opposite side from the buttons. Leave the front section slanting down as pictured. You can either leave this just as a fold or choose to use your yarn or tapestry needle to tack this section in place. Secure and weave in all ends. Repeat rows 7-10 until your piece measures approx. 20 inches (50.75cm) from the starting edge. End on a repeat of row 10. Pick up and Single Crochet 55 sts around the top of your hat. Make sure the stitches are evenly spaced, and that you’re doing your single crochet stitch around the outside BPSC stitch we did along this edge. We’ll be working in continuous rounds for the decrease section. Place stitch marker. Add three matching buttons (I used 1.25”) stacked one on top of each other over the overlapping section of your hat. Then, fold up approx. 1.5 inches (3.75cm) of the brim of hat on the opposite side from the buttons. Leave the front section slanting down as pictured. You can either leave this just as a fold or choose to use your yarn or tapestry needle to tack this section in place. Secure and weave in all ends. Repeat row 3 until your piece measures approx. 2 inches (5cm) from the starting edge. Repeat rows 7-10 until your piece measures approx. 22 inches (55.75cm) from the starting edge. End on a repeat of row 10. Pick up and Single Crochet 60 sts around the top of your hat. Make sure the stitches are evenly spaced, and that you’re doing your single crochet stitch around the single BPSC stitch we did along this edge. We’ll be working in continuous rounds for the decrease section. Place stitch marker. Add three matching buttons (I used 1.25”) stacked one on top of each other over the overlapping section of your hat. Then, fold up approx. 2 inches (5cm) of the brim of hat on the opposite side from the buttons. Leave the front section slanting down as pictured. You can either leave this just as a fold or choose to use your yarn or tapestry needle to tack this section in place. Secure and weave in all ends.